This photo was taken of the Twin Towers 9/10/01 the day before 9/11. 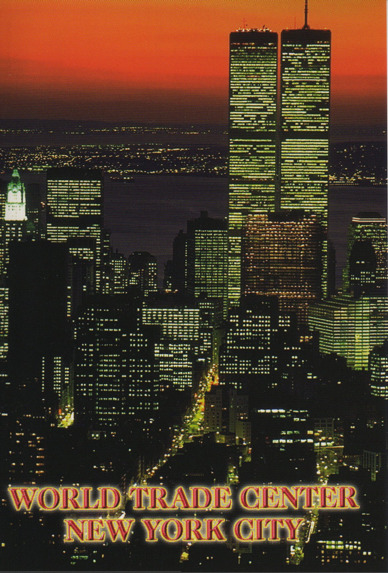 The sun's reflection appears to form a sparkling cross between the towers. The clouds & jet contrails also form crosses in the sky. So innocently beautiful, now an incredible remembrance. I personally awoke from a nightmare in the wee hours of 9/11 remembering a dream of looking up at a beautiful blue sky & the clouds forming the words 'Death will come from above'. I'm always having dreams with specific meanings, but this dream really freaked me out. I turned on the TV & checked the news, nothing... 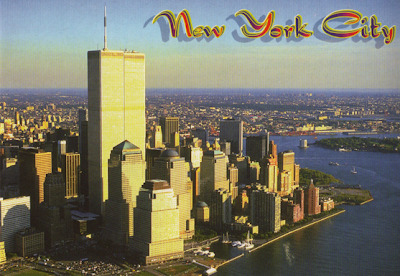 I turned on my computer to search the Internet & the #1 North Twin Tower had been hit. I thought I was still dreaming, but I wasn't. 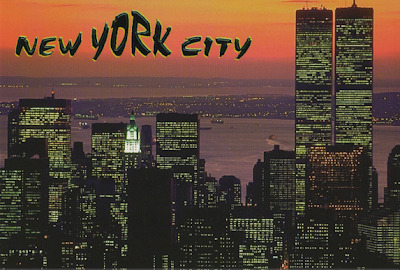 Finally the TV news started broadcasting with visuals of the North Tower on fire. My hubby who's hometown is Manhattan New York was working on his computer when I called for him to come quickly & see the New York news bulletin showing one of the Twin Tower's had been hit by a 767 jet plane. When suddenly the second Twin Tower was hit by another 767 jet plane. With tears rolling down our faces we began praying for all those in harms way. Watching this live was a nightmare & we will NEVER FORGET. We are still praying for all those innocent victims of 9/11. 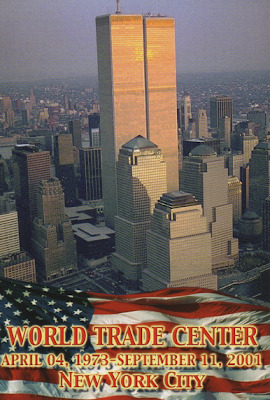 An American tragedy that will forever be in our hearts, minds & history books. Nearly 3,000 victims died in the attacks on the World Trade Center, Pentagon & White House. 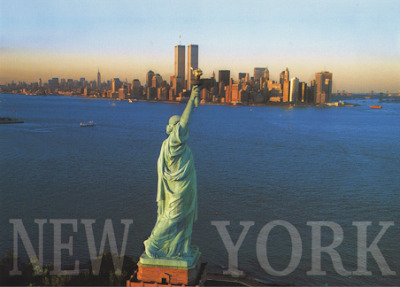 According to the New York State Health Department a total of 836 responders, including firefighters & police personnel died that day. Our hearts & prayers go out to the Victims, Families & the Heroes that lost their lives trying to save others from eminent death. 9/11 is a very sad day in history & we will never forget the hardship & tears of all those concerned. Through the rebuilding of American faith & dreams we will always over come. 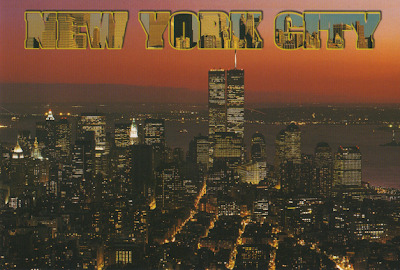 As for today we would rather remember the memory of an amazing American Feat & Icon ~ The World Trade Center. 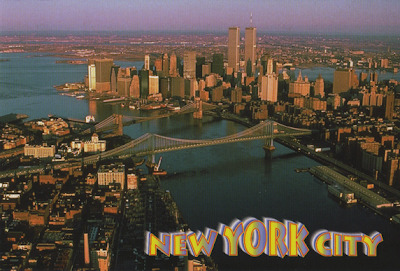 The original World Trade Center (WTC) was a complex of seven buildings in Lower Manhattan in New York City. At the time of their completion, the first World Trade Center & the second World Trade Center known as the Twin Towers were the tallest buildings in the world, surpassing the Empire State Building which is also in Manhattan. #7 WTC Office Building above a Con Ed Power Station elevated walkway connecting to the WTC Plaza. 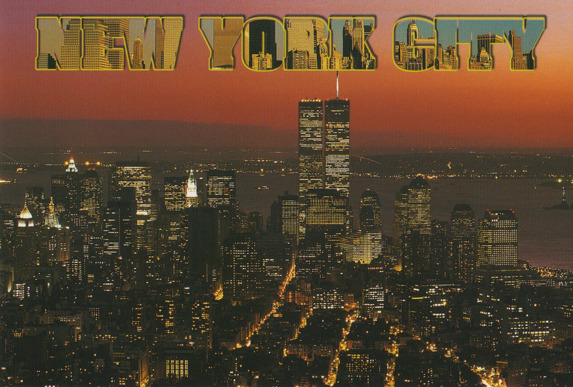 The World Trade Center gift shops had beautiful collectibles & keepsakes from before 9/11. Incredible memorabilia that so many visitors & collectors loved. Our uncle had a Manhattan store & passed away on 9/11. His family requested us to help out the store owners who could not meet bills due. 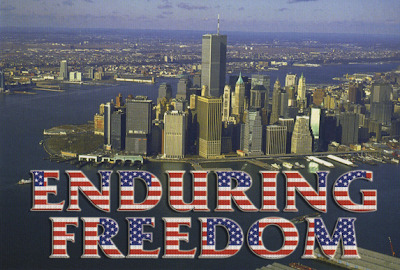 We donated as much as we could & waited to sell the vintage WTC collectibles a decade later. 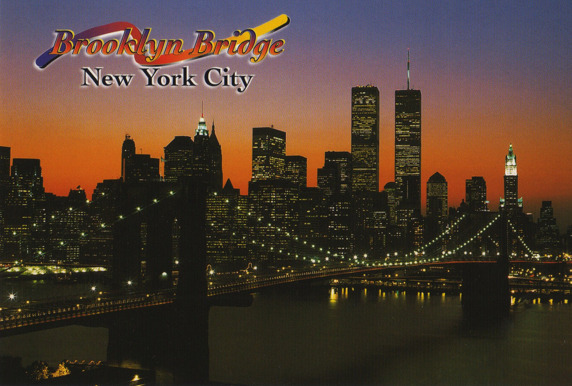 Before these collectibles were discontinued, we obtained what collectibles we could from the companies that provided the WTC gift shops. 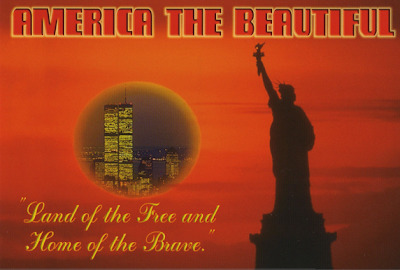 Every WTC collectible we are offering is a beautiful vintage Pre-9/11 WTC Twin Tower Treasure. As collectors ourselves, we hope you'll love & treasure this collection as we do.